At the recent "Earth, Wind and Fire" conference* I spoke to a medical student who told me about how she'd developed breathlessness, cough and a high temperature whilst descending from the summit of Kilimanjaro. These symptoms persisted and she visited her GP on returning to the UK. A throat swab confirmed the presence of influenza B. Now I would have missed this diagnosis! The ascent of Kilimanjaro had taken place during her summer holidays and I had always assumed that influenza followed a seasonal pattern. It certainly does in the UK! But according to the textbooks, cases of influenza commonly occur throughout the year in equatorial countries. 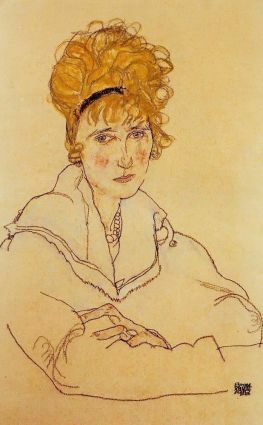 Edith, the pregnant wife of Austrian artist Egon Schiele, died from "Spanish Flu" on the 28th October 1918. Egon also contracted the disease and died three days later. The 1918 "Spanish Flu" pandemic was estimated to have killed between 50 and 100 million people. A recent report in the The Guardian shows that influenza continues to claim lives. So far this winter 2182 patients with influenza have been admitted to critical care units in England. Of these, 195 have died. HAPE and respiratory tract infection. I've seen heaps of both over the years, alone or combined. I've always thought a respiratory tract infection has to be a predisposing factor for HAPE. But despite this widely held belief there's only a limited amount of science to back it up. HAPE is a life threatening disease that causes breathlessness amongst visitors to high altitude. The condition stems from a pressure increase in the blood vessels that connect the heart to the lungs. In some individuals, this pressure damages the thin membrane that separates the two organs and causes fluid to escape from the circulation and into the lungs. Many assume that a pre-existing infection can not only cause the pressure in the blood vessels to rise, but can also cause direct damage to the membrane which together leads to an increase in the risk of HAPE. It all sounds plausible, but the hard part is proving it! Is there any human or animal based evidence to support the idea that a respiratory tract infection is a risk factor for HAPE? The only human study that I was able to find dates back to 1997 (1). A team based at Snake River Medical Centre in Dillon, Colorado (2800m) examined the medical records of two groups of HAPE victims - 27 children (aged 1 to 16) and 127 adults (aged 17 to 78). The results were contradictory. Pre-existing infection was common in children (79%) but rare in adults (13%). The authors gave two explanations for this difference. First, the capillaries that line the lungs are undeveloped in children and are easy to injure. Any pre-existing infection places the fragile alveolar-capillary membrane at enormous risk and therefore makes the likelihood of HAPE more likely in children. Second, and somewhat more cautiously, these results may simply reflect the high prevalence of infection in the paediatric population. It may be that at any point in time 79% of Colorado residents aged between 1 and 17, have a viral or bacterial infection. Therefore any link between HAPE and a respiratory tract infection may simply be a coincidence! Can animal studies shed any further light? There are several but I'll just focus upon one. Following their study at Snake River Medical Centre, the previously mentioned team of researchers went on to study the effect of viral infection upon a small group of young rats exposed to 10% oxygen (2). After 24 hours of hypoxic exposure, the researchers found that the lungs of infected rats were significantly heavier than healthy controls. Much of this was due to water and protein that had collected in the lungs of the sick rats. The authors concluded that rats infected with a respiratory virus and exposed to 10% oxygen had findings that were consistent with pulmonary edema - "a finding of potential relevance to human HAPE". A chest radiograph of a 34 year old man with influenza B and HAPE**. It is unclear whether the changes are due to infiltrate, edema or both. 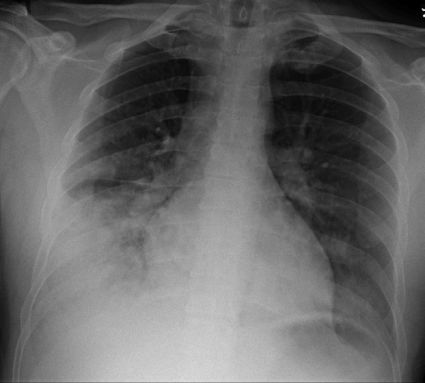 A pleural effusion can also be seen at the base of the right lung. Further research is clearly needed. There must be a number of databases that have data on HAPE victims. Is there anyone willing to take a look and see if there is an association with pre-existing infection? Better still, is there a research group who are willing to infect healthy volunteers with a respiratory virus, transport them to altitude and monitor them for signs of HAPE? It might seem far fetched but ultrasound, echocardiography and even broncho-alveolar lavage have been performed at altitude. In reality, altitude is an insult to the respiratory system in so many different ways, I feel like everyone is on a spectrum of respiratory distress ranging from a dry tickly cough and runny nose because it's cold, the normal hyperventilation of altitude, coughs and blocked noses of upper respiratory tract infections, hacking high altitude coughs, and finally, the frothing at the mouth gasping HAPE-ers. The more boxes you tick the sooner you get HAPE! Infection may be just one of many factors that lead to the development of HAPE. Environmental factors, the acclimatisation process and other acute illnesses may all play a part. Studying the link between HAPE and infection in isolation may be unrealistic and distract us from the many other insults that may be playing their parts. *This is an excellent 2 day conference organised each year by the King's College London Wilderness Medicine Society. My thanks to the organisers for inviting me to take part. **The fascinating case of a 34 year old man who developed influenza B and HAPE can be found here. (1) Durmowicz AG, Noordeweir E, Nicholas R, Reeves JT. Inflammatory processes may predispose children to high- altitude pulmonary edema. J Pediatr 1997;130:838–840. (2) Carpenter TC, Reeves JT, Durmowicz AG. Viral respiratory infection increases susceptibility of young rats to hyp- oxia-induced pulmonary edema. J Appl Physiol 1998;84:1048–1054.